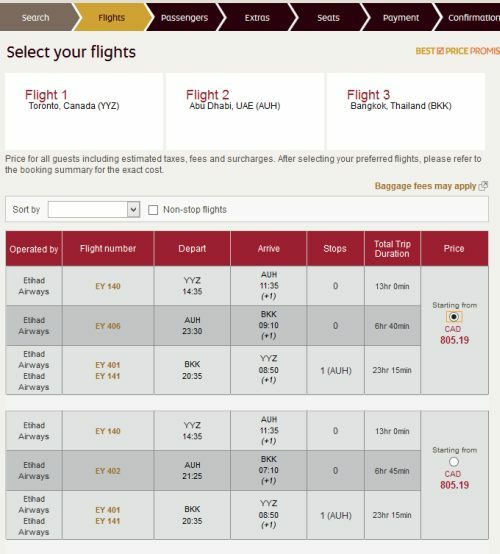 Etihad Airways has dropped the price of their Toronto - Bangkok, Thailand flights throughout the year down to $845 CAD roundtrip including taxes. It's also possible to fly Toronto to Bangkok to London, UK for $514 CAD total, and then buy an additional one way flight back from London on WestJet for $388. Toronto to Bangkok to various other cities in Europe can be had in the $600s. The Toronto to Bangkok to Europe strategy can help avoid the long layover situation that affects some of the roundtrip fares. Throughout 2016, except June, July, and August. A one way flight from Bangkok to Europe usually goes for more than $800-$900 on it's own. 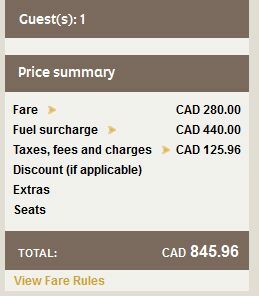 A Toronto - Bangkok - Europe multi-city flight would normally run $1500+. But this may only be that valuable to someone who wanted to visit both Southeast Asia and Europe in one trip. For someone looking for a regular roundtrip flight to just Thailand on it's own, it's around $300-$400 below the typical bottom prices. Click on the departure date box to open the calendar view and try other dates. 2. Click through from Google Flights to the Etihad Airways website for booking. Tip: When you get to the Etihad Airways search result, try scrolling through the dates using the 'Prev' and 'Next' buttons. Look for the dates with fares in the low $400s. Tuesdays, Thursdays, and Saturdays generally seem to be the dates with the lowest prices. Update: Some dates are verifying at $805 CAD roundtrip including taxes. May 5 to May 18 is example. Update: A promo code has been released that can bring the Toronto - Bangkok flights down to $776 CAD roundtrip including taxes! 1. After you've found some cheap dates on Google Flights, go to the Etihad Airways home page. Starting your search from scratch on the home page is the only way you can enter the promo code. 2. Search for a flight from Toronto to Bangkok, using the same dates you found on Google Flights. 3. In the promotion code box, enter the promo code K5S7B76 to save an additional 10%. 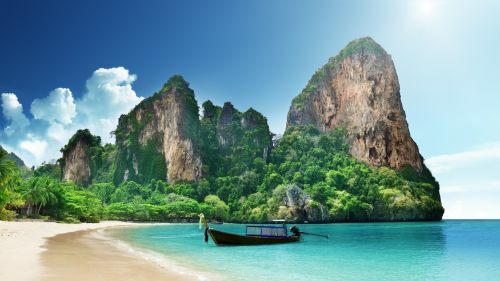 It's also possible to fly Toronto to Bangkok to London, UK for $514 CAD total, and then buy an additional one way flight back from London to Toronto on WestJet for $388. Try experimenting with other dates. Tuesday to Monday flights are your best bet to start with. Update Feb 24: It seems like the Toronto-Bangkok-London flights are now all in the $800s. toronto, yyz, flight deals, bangkok, thailand, asia, southeast asia, bkk and etihad airways. 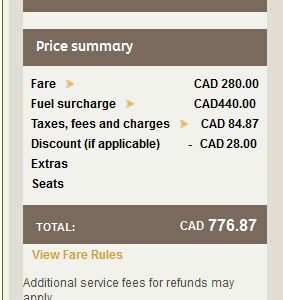 One Response to "Toronto to Bangkok, Thailand - $845 CAD roundtrip including taxes"
Can we extend the Abu Dhabi layover from 6 hours to more than 12 hours for the same price?